When I returned from my outing and turned on the computer, prickles of sweat bloomed on my forehead. My plan had gone terribly wrong. Rather than judiciously spreading my dollars across a few high value stars and filling the bulk of my roster with dependable, middle of the road players as I had anticipated, my robo-drafting scheme had spent most of my funds on just a half dozen players, leaving me no more than one dollar each to fill out my remaining 21 spots. The draft was still going on, but I was at a huge disadvantage. Almost any player that was of general value was out of my reach, since all the other league members had far more money than I to spend. When you get to the point of having just one dollar to spend on your remaining spots, you know you’ll be scraping the bottom of the talent barrel. Even with my half dozen stars, if the rest of my roster was dreck, I didn’t stand a chance. My only hope was to try to figure out if there was any category of player, any specific type of skillset that might be undervalued enough by the other league members to allow me to somehow recover and get competitive players at a dollar each. How did I do? I’ll tell you in a bit. My experience with the draft led me to speculate about undervalued skillsets and market inefficiencies in the people we hire to do drug discovery and development. Every company competes to hire from the same pool, and one way to gain value from the market is finding areas the market doesn’t value as highly as it should. One key area I think is undervalued is adaptability. I believe this is undervalued because while it represents the long-term view of what we want in our workers it’s not how and why we hire. When we hire scientists the mantra that gets repeated in pharma and biotech is hiring for need, and hiring for the best available scientist. At the entry levels companies are looking for good individual performers, and hiring managers focus during the CV review and interview processes on clear evidence of that skillset–strong scientific thinking, well designed experiments, novel approaches, good communication of results. When thinking about why this happens, I see two reasons. First, these are qualities for which we are skilled at evaluating and comfortable measuring. Second, most scientists start in academia, where the overall currency is scientific quality because good science is what gets grants. There’s a strong selection in academia for high individual performers because they’re the ones most likely to get that initial R01 fresh out of their postdoctoral research, and getting established has traditionally been a big boost to continued funding (although the gap has closed in recent years). In pharma and biotech though, should scientific acumen and individual performance be the primary considerations? I’d argue that because the nature of biomedical research is becoming increasingly collaborative, complex, cross-disciplinary and uncertain, the need for adaptability is rising in importance. There is a strong trend in pharma towards collaborative research, whether internally across stakeholder groups or externally with academic centers, small biotechs, non-profits, or device and diagnostics makers. This kind of environment requires flexibility and the ability to see things from various perspectives. We’re also familiar with numerous examples of how perceived needs in hiring strategies can change with a shift in the corporate winds, and a scientist can be hastily repurposed within months of being brought on board. This is better served by adaptability than by strict scientific ability. Another reason to hire for adaptability is that drug development is in a period of transition and probably will continue that way for the future. I don’t think there will be a new normal that holds steady for 20 or 30 years, but rather fragmentation, rapid change, and external forces of all kinds that are outside the control of the industry. For example, the recent rejection of Sanofi’s pricing scheme for Zaltrap by physicians at Sloan-Kettering is something I doubt was in anyone’s marketing plan. In an environment like that I think a company wants people who, while not liking change–and let’s be real, no one really likes change–can nevertheless handle change and see it for a source of new opportunities, and can do that again and again. To be clear, I’m not arguing that scientists should be hired that are of poor quality. But the pool of qualified scientists is quite large and getting larger all the time. Everyone would like the scientists at the intersection. But they are truly rare. 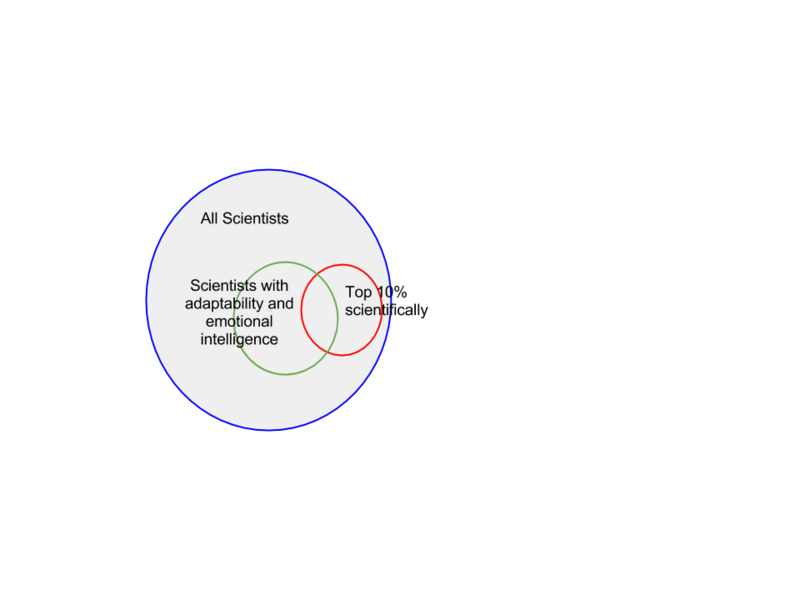 The default is to look in the rest of the red circle–those scientists who have a track record as star individual performers. But what about the green circle on the left? These are scientists who are smart, capable, and also have skills that lend themselves to adapting to changing circumstances and collaboration. A telling set of statistics put together by Thomson-Reuters shows that the number of authors per scientific paper has been increasing over the past twenty years, and one of the greatest increases has been in the publications about clinical trials. This tells us science is getting more collaborative all the time, and hiring from the green circle meets the real needs of drug development as much and maybe more than shooting for the red. Of course, this thinking does us no good if we can’t distinguish those green circle scientists in the first place. To riff off of Gregory Cooper and Jay Shendure (who were talking about finding causal variants in genomes), would we be looking for needles in stacks of needles? How do you detect adaptability? Ultimately we would like to observe behavior. Even from the traditional forms of information, there are clues. Has a person moved around for their education? How did they handle that transition? In the interview, emphasize questions about dealing with change and make the answers to those questions as important in hiring decisions as number of publications or pedigree of lab. A recent interview with Laszlo Bock from Google highlighted the value of these kinds of behavioral questions. Rather than making behavior the topic of the last question asked after all the science questions are done, make them the first and ask a lot more of them. Provide future scenarios and listen closely to how a person handles hypothetical change. For example, ask her ”What if the FDA declared no drug would be considered for approval that did not have clear effectiveness compared to existing drugs–how would that affect your job and what you would do to make this company successful?” If there is worry that this would put people on the spot, let them take this as a written exercise, with time to think. Another question one might ask could be, to paraphrase Dirty Harry, “Do you feel lucky?” There are the beginnings of research around the concept of luck and how that applies to business, and it’s a fascinating study. In this context, however, we’re not actually trying to see if someone consistently beats the odds, but rather how she sees the world–as full of opportunities that fell into her lap (lucky), or as someone who feels the world provides barriers and hurdles (unlucky). More evidence of adaptability could come from educational history. I don’t just mean formal classes–has the applicant done things like take a Khan Academy or MIT distance learning class just for fun and made it all the way through? Have they made efforts to grow or does their career seem very linear? For a scientist, did they make a field switch between graduate school and their Postdocs, or did they take the route of sampling the same flavor of biology? Do they even come from an different field, like physics or computer science? Social media presence is already being mined by HR for red flags. I think it can also be mined for green flags (as described by the Wall Street Journal). If applicants are willing, request a copy of their LinkedIn or Facebook networks and evaluate the people they are connected to. See if they show a diversity of connections and interests as reflected by the people they choose to be associated with. Companies recruiting programming talent have done searches of individual work and reputation on the internet to find new sources of talent. Perhaps similar searches tuned towards adaptability could unearth new candidates for research positions. There are also ways to observe behavior that might be a little more inventive. While it would take some time and funding to set up, a company could contract with a game-design shop to create a role-playing game simulation. It could be as real or as fanciful as you like, but the key element would be putting the applicant into changing situations and seeing how she reacts. While a colleague of mine suggested this would just lead to hiring people who are really good computer gamers, I still think scenario testing in this way could give insight into how flexible a person can be. These are just a few thoughts about how maybe we can judge how adaptable a person will be. There are doubtless better tools. But what I am really suggesting is that however it’s measured, the quality of adaptability should be bumped up in the hierarchy of choosing which candidates to interview and ultimately hire. This entry was posted in Baseball, Big Data, Biotech/Pharma, Business, Knowns and Unknowns, Metrics, Randomness, Serious Games and tagged adaptability, collaboration, fantasy baseball, market inefficiencies, organizational structure, undervalued assets, unknowns. Bookmark the permalink.